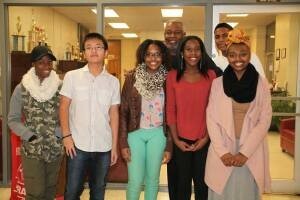 Five Stone Mountain High students, pictured with members of the school community, will participate in the 2016-2017 Governor’s Honors Program. Five students at Stone Mountain High School have been selected to participate in the Governor’s Honors Program (GHP), a highly prestigious four-week summer instructional program that offers enrichment for talented and intellectually gifted students. According to the program website, GHP is held in mid-June to mid-July as a residential educational experience. Students attend classes in the mornings and afternoons in specific areas of study, and they participate in a wide variety of social and instructional opportunities every evening. Meals and rooms are provided by the program. Sophomore and junior students were selected after being nominated by their subject-area teachers. The program offers instruction that is different from their traditional high school classroom, with an emphasis on providing students with the academic, cultural, and social enrichment necessary to become the next generation of global critical thinkers, innovators, and leaders.